I recently re-read one of my older blog posts and thought it very appropriate for the subject of this blog series “2018: A Year For Hope”. So today … we’re going back a few years to what was originally posted as “Teathered To Hope“. I’d love to hear your thoughts! About the only thing I know for sure about boating is that unless you want to get wet, the general idea of being in a boat is to stay out of the water. And the general idea of casting anchor is to keep you tethered to a select and stable place. and are for exclusive display on the website PuttingHopeToWork.com. It was several years ago when I first noticed it while reading Psalm 37. Over and over again, the same phrase … “inherit the earth / inherit the land” And I thought to myself, what in the world does that mean? Obviously, something significant or it wouldn’t be repeated so often – but what? So like I often did (and still do), I just sort of tucked it away in my heart with a note attached that said ‘this means something to me, but I don’t yet know what’. Well, here we are in 2014, and recently God has brought that phrase back to me. It felt rather like a “re-awakening” of something unsettled in my spirit, and as sometimes happens when God begins to stir something up within you, I began noticing references to ‘inheriting the land’ appearing almost everywhere! Preachers I listen to started using it in podcasts. Devotional readings included it. Worship songs sing of it. By now I am really starting to get hungry for knowledge … I want to know what this means to me Lord! What are You saying to me? To “inherit the land” is to receive from the Lord secure entitlement (for them and their children) the promised land (redeemed sphere and bountiful source of provision). Now I don’t know about you, but that lights my fire! And the more I studied, the more excited I got! The Bible is filled with scriptures speaking of ‘inheriting the land’, which I now understand is the promise of ‘a secure entitlement’ that is generational, and of the inheritance of a ‘redeemed sphere’ that is well able to supply far above my need (be it for finances, for relationship, for healing, for protection, or whatever the need). That is some Good News, folks – and it inspired a the following painting. God is so funny! I just love the way that He works with me, talks to me, and sometimes even paints with me! This painting started out as a mess (as had the other 5 attempts to paint based on my own limited skill and ability). 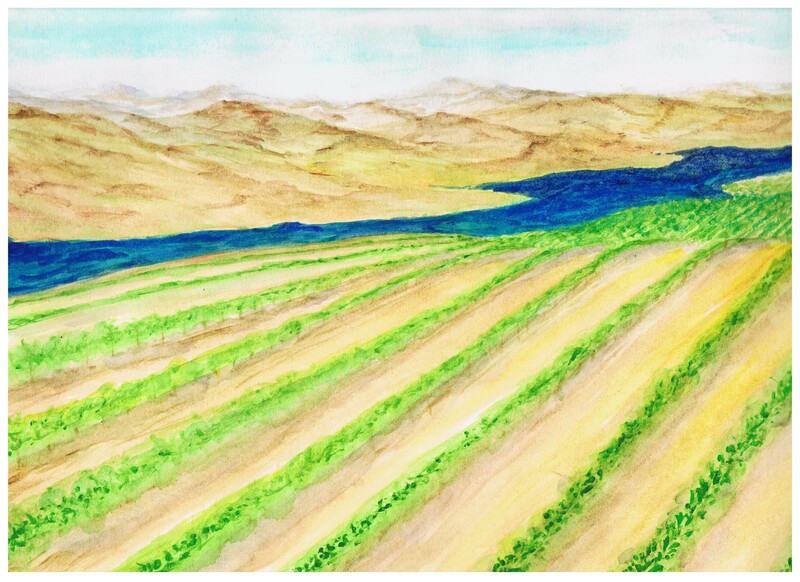 But I’ve discovered that when the Lord is painting with me – somehow the ‘oops-ies’ turn out to be something useful in time, and much to my surprise over the course of about 3 weeks this picture emerged, complete with dry and barren mountains in the background contrasted by lush and fertile fields in the foreground. (And to think I almost tossed it after the 1st night!) The river was added at the end, by inspiration of the Lord, and immediately made me think of the Israelites crossing over the River Jordan to the Promised Land. Where are you in your journey, my friend? As you read through Psalm 37 on your own, be encouraged. We all go through desert seasons. We all face enemies. We all have rivers to cross. But praise God, we also all have the promise of the abundant life calling us forward into greater and greater life with Him. Keep pressing on – and go take possession of all that God has promised is yours, through Christ Jesus! I can’t tell you how many times I’ve gone back in my mind to that day, to the invitation to walk out into deep water with Him. Just as precious to me is the instruction He gave me later that year, the same instruction He gave to Moses and the Israelites. God had promised His people a land overflowing with milk and honey, but they still had to ACTIVATE the promise by ‘begin(ning) to possess it’, so that they could (later) inherit it. In other words, obedience was required to take hold of their inheritance. I would like to say that I’ve not only walked on water, but that I’ve reached the other side of the waters and am now living in an ocean front property. In truth, I’m still in the process of ‘walking it out’ so that I may inherit what was promised. Are you holding onto a promise of God, but have yet to fully take hold of it? 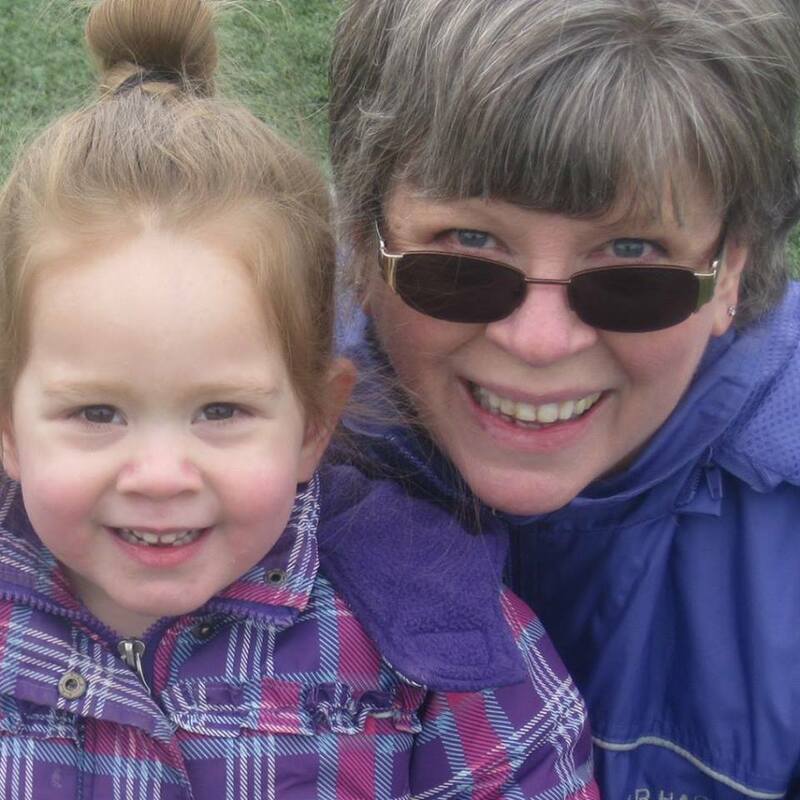 Recently, while visiting my oldest daughter and her two little girls, I had taken my glasses off so that I could better rough house with them a little. One of my favorite things to do with these little munchkins is to swoop them up in my arms, swing them around a bit, and then bury my face in the crook of their neck and kiss them until they squeal with delight. And as you can imagine, that kind of playing has bent my glasses out of shape on more than one occasion – and so I’m getting a little better at taking them off first. Now maybe it’s one of those things that you just had to be there to appreciate, but it really was quite hysterical and had me chuckling for many days afterwards. What a precious little darling she is! But then as the days went by, her words began to ring in my ear for another reason. Let me explain. I have been leading a ‘small group’ through my church for almost 2 years now, the general theme of which is ‘the inherent power of the Word of God (as contained in the Bible) to address/satisfy every need and overcome every circumstance we face here on earth’. And as one might suspect, we are continually referring to the Word of God (the Bible) for insight as to what God has to say about any particular matter of life. We have studied ‘prosperity’ and provision. We have studied ‘health’ and healing. We have studied ‘wisdom’. But whatever the subject of study, one thing is required in order to hear and comprehend so that you can experience change … that you ‘change your focus/perspective’ from that of the reader (i.e. the one stuck in the quagmire of a particular circumstance) to that of the Ruler (.e. the one who reigns over all). A change of perspective. A change of vision. And isn’t that what eye-glasses do? They heighten and improve your focus so that what was once blurry is now easily recognizable and identifiable. And with that empowerment (to recognize and identify) comes the ability to execute with wisdom and authority (where once was doubt and confusion). Thankfully, when I take my glasses off to play with my grandchildren, I can still see well enough without do most things with competence. I can still see and recognize people. I can still drive. I can still read … well, sort of. But all those things require a lot more effort and eye-strain to do them as opposed to when I’m wearing my glasses. It’s the same when facing the circumstances of life. Natural reasoning can work, sometimes. We’ve all experienced a certain level of success grunting through life on our own wisdom and strength. But how exhausting! What I really need when facing the circumstances of life – be it sickness, challenges at work, relationship issues, or whatever – is a higher perspective. So here’s to putting on my “God glasses” (and keeping them on!) so that I can see things more closely to the way that He sees them. And from that higher perspective, may I daily be empowered by faith to trust and follow Him into the “whole and complete life” that He has planned for me!! For the last several years, it has been my practice that in December I enter into a time of reflection on the closing year, and goal setting for the next. They say that something like only 8% of New Years Resolutions are kept, and I’ve certainly made regular contributions to the 92% failure rate. Yet in spite of all those ‘failed’ resolutions, I have made great progress towards the fulfilling of some of my recurring resolutions. For example, while I still haven’t reached the level of physical and mental fitness that is required for me to run a 5K non-stop, I have discovered that I like to walk/jog – and I’ve completed at least five 5K’s since my first in 2012. I’m now looking forward to restarting my C25K training this spring, but with a body prepared over the winter with strength and flexibility exercises. Progress! Nor do I weigh what I want (and ought) to weigh. Yet I have completely changed my eating habits over the last 6-7 years with even more changes being implemented in 2015, and as a result I am better positioned than ever to live strong well into my 90’s. Progress! 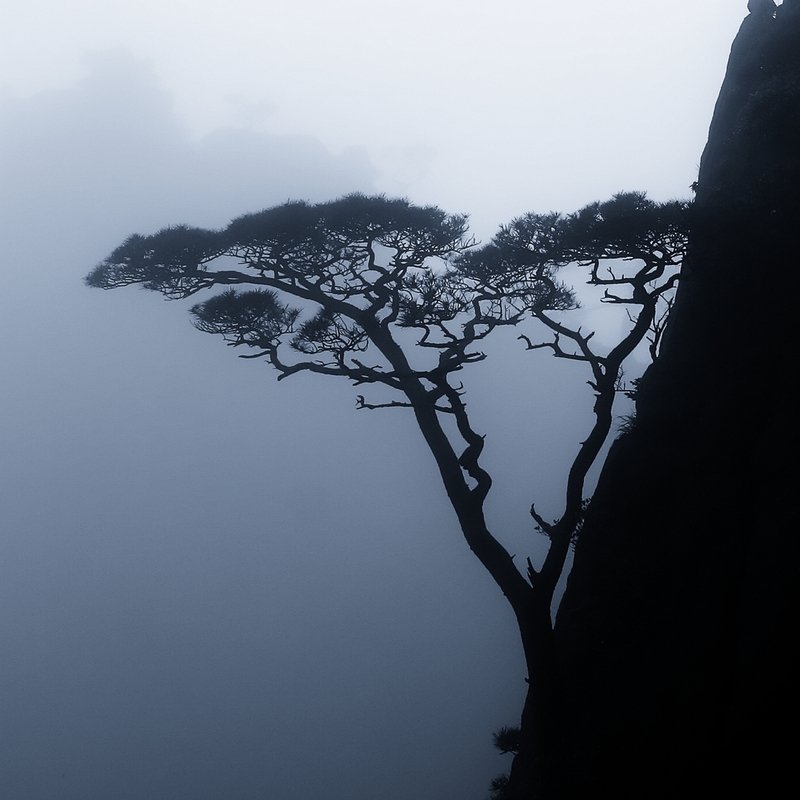 As I vision cast for 2015, an image comes to mind … that of a seedling imprisoned by stone, yet pressing onward into life. These wonders of nature are even more inspiring when they are seen growing out of the side of a vertical rock cliff. One can only imagine their journey from seed to seed-producing and bird-sheltering trees that survive season after season, decade after decade. In my mind’s eye, I envision a lone seed being dropped by bird or squirrel, later washed by flowing currents of rain deep into the crags between opposing rocks. In darkness, the seed finds a little pocket of dirt, just enough to enrobe itself with the necessary soil, moisture, and organisms required to initiate the transformation from seed to seedling. Time passes and from the safety of its craggy entombment, tender tendrils of life emerge. Against all odds, the seedling presses through dirt and rock to receive nourishment of the morning sun. Eventually, the seedling outgrows the confines of its home. It is root bound and has used up every millimeter of space for its ever increasing trunk. As a result, access to the root system has been blocked for rainwater and airflow. What once was shelter has now become a prison, and the young tree is entrapped and compromised. The situation appears hopeless. Have you ever felt like that? I have! And the answer is PERSERVERANCE! 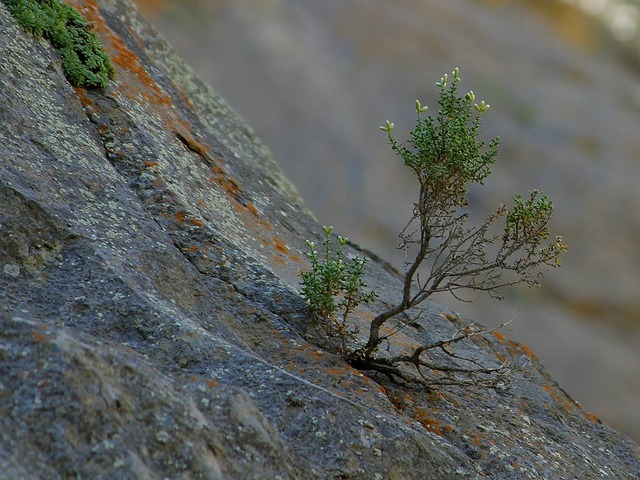 For with perseverance, even a 1-day old seedling can eventually force the rock to move out of its way so that it can grow into full maturity as an adult tree! This truth gives me great comfort as I make New Years Resolutions for 2015 that are echo’s of 2014 resolutions, and 2013 resolutions and so on. After so many failed attempts to _______________, the temptation is to either lessen one’s goals to something believed as more readily achievable, or to discard those dreams altogether. I mean, who needs yet another reminder on 1/1/2016 of ones failure to _________? But not this year! I shall not quit pressing on for the dream of what is in my heart to do, for I know that with perseverance of faith and continued obedience to His leading, I will eventually see manifestation of what which I am presently believing God for. The mountain WILL move! So here’s to 2015! Let us dream big, and press on to take hold of all that God has put in our hearts to become, and to do for the glory of His Name!